"Magic is what Augmenta is." Amazon Studios & Magnolia Pictures have revealed a trailer for the sci-fi film Creative Control, from director Benjamin Dickinson, who also stars in this indie. The setting is New York, 5 minutes in the future. The story inovlves a company that invents augmented reality glasses, but an overworked, tech-addled advertising executive there takes them too far when he develops a life-like avatar of his friend's girlfriend to replace his real girlfriend. Of course this doesn't go as well as he hopes. The cast includes Nora Zehetner, Dan Gill, Alexia Rasmussen, Meredith Hagner and Reggie Watts. Enjoy. In near future Brooklyn, an ad executive uses a new Augmented Reality technology to conduct an affair with his best friend's girlfriend…sort of. "The film explores the life-changing aspects of a new pair of AR glasses called Augmenta." Creative Control is directed by American filmmaker Benjamin Dickinson, of First Winter previously as well as a number of short films. The screenplay is written by Benjamin Dickinson & Micah Bloomberg. This premiered at last year's SXSW Film Festival and also played at the Denver Film Festival. 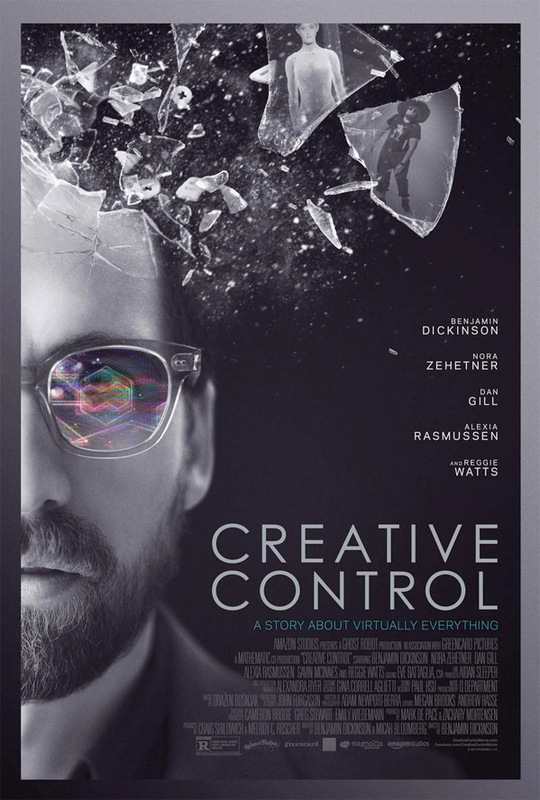 Amazon Studios will open Creative Control in select theaters + VOD starting March 11th, 2016. Quite artsy. Reggie Watts is quite good. you can probably count on it. Yeah, smart idea to highlight Watts in the article's title since his presence is probably the only reason I might watch this. Definitely looks interesting though. I like the premise. I wonder when they will use color. That's gonna be very interesting.